Getting up early on a Saturday morning to learn how to play hockey is a good incentive to actually get up early on a Saturday morning. But Saturdays over the summer tend to get "eaten up" by other activities. Going out of town or to a convention -- as people are wont to do over the summer -- many times trumps a regularly occurring athletic endeavor. 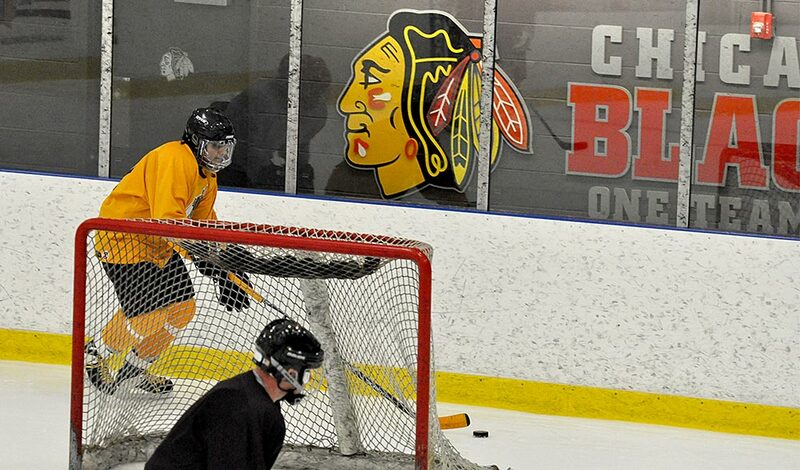 Case in point: I missed Class #2 of "Hockey 101" at Johnny's Ice House due to the Chicago Blackhawks Convention. A classmate of mine later told me that over ten students were missing from class that day. Coincidence? I think not! Class #3 was also "lost" to the National Sports Collectors Convention -- basically, world's biggest baseball card show, which was hosted in Chicago this year. But I got my priorities straight: I'm a sports collector first and a wannabe athlete second. Never pass directly to the person. Instead, pass to where they are going. Passing around (or through) a defender is harder than it looks! The person passing the puck has to do what they can to make sure their pass gets to the receiver -- not just fire it at them and hope for the best. The person reeving the puck has to make sure they get to the puck. That means picking up their pace or making an honest effort to get to where the puck is going to be. I know this all sounds like common sense -- especially to those of you who played a lot of sports growing up. But I found myself firing off passes that were too hard or too fast for the receiver? Is it their fault for not being good enough to handle a (relatively) fast pass? No. Likewise, I found myself lazily trying to receive a pass with one hand on my stick. Also bad. We spent the last 12 minutes of our hour-long class scrimmaging. Having gained a bit of endurance from running -- and having a line change every minute or so -- makes scrimmaging much more enjoyable. In fact, I didn't spend too much time on the bench catching my breath; I was standing, watching the play and anxiously waiting to jump the boards and get back on the ice! As summer winds down, I am wondering if I should take the plunge now and try joining a team. The lessons at Johnny's Ice House have been great, but something about a little competition really gets me motivated.